Congratulations on choosing Ipe wood! Ipe Woods USA is happy to provide you with this guide to make your Ipe wood installation perfect! You’ve made a great choice on a long-lasting investment! Ipe wood is beautiful, strong, dense and long-lasting. Because you will enjoy this wood for years to come, Ipe can benefit from a bit of extra attention to detail for proper installation. This guide is to help you simplify the installation process of your beautiful Ipe wood. Ipe wood is known as “ironwood” because it is so durable, but that means it also requires a few special considerations during installation. To install Ipe wood, follow these directions for your best result. Be sure to visit our page concerning common Ipe deck installation problems for common issues. Due to the density of the Ipe wood, regular tools frequently are not enough to handle the job. This hard and dense wood needs special saws and drill bits. For sawing, go with premium carbide tipped saw blades. For drilling, we recommend Brad point or Fostner drill bits for a cleaner hole. Now you are ready to begin preparation and installation! Before you begin to install, check with your local municipal offices about any applicable local ordinances. They will inform you of building codes and ordinances. Municipal offices can guide you in obtaining the proper permits. Obtaining the proper permits is solely your responsibility. Also, we advise you to consult with an architect before starting, because each project is unique. With so many variables involved, the material must be tested for suitability before you begin. Remember to follow all manufacturer’s instructions for each product you use while installing your Ipe wood. If you find differences or contradictions in either instructions or building codes from those provided by Ipe Woods USA, contact us and we can help you sort it out. Our Ipe wood is generally air-dried lumber unless otherwise specified and air-dried is perfect for outdoor projects such as: playgrounds, decks, sheds, planter boxes, outdoor furniture or even siding. There are many more appropriate uses. Just use your imagination! This wood is perfect for almost any application! And yes, it can also be used indoors, but is most frequently used outside! There are three basic styles of Ipe wood. One, pre-grooved Ipe wood decking, which allows for a clip between boards. Two, standard style. And three, tongue and groove boards. One of them will be perfect for your project. Be aware, tongue and groove Ipe wood decking should only be used under a covered porch or patio. When tongue and groove is used without protection, too much water can accumulate. This has the potential to cause your Ipe wood to buckle, swell and cup. Standard and regular pre-groove can be used without additional protection and are the woods most frequently used for projects exposed to the elements. Getting the wood ready to install–acclimate your Ipe wood! Ipe wood needs to acclimate to the local conditions (temperature and humidity). This is true of any hardwood. This means it needs to sit near where you will be installing it to adjust to its new climate. Leave it there for a least seven (7) days, or longer if you are in a drier climate. Don’t store Ipe wood for more than 30 days without checking with us at Ipe Woods USA for additional handling tips. 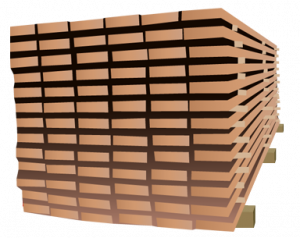 We recommend you store Ipe wood on blocks of wood. Do not sit Ipe wood on the ground or on a concrete surface to acclimate. It must be stored at least 12 inches off the ground to let the bottom boards get enough ventilation. If it is not interacting with the environment, it is not acclimating! Cover Ipe wood with plywood during the acclimation process. Do NOT cover the Ipe lumber with a tarp or any plastic. These trap water and moisture and can create stability issues. Ipe must be kept dry until it’s installed. Air Ipe wood outside. Do not store it in an enclosed space, such as a garage or any other enclosed area. 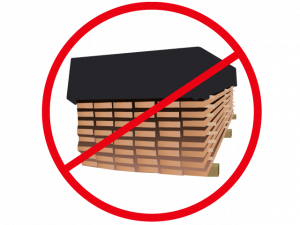 Proper ventilation is best achieved by separating the layers of boards with wooden shims. The more air can move around the boards before installation, the more acclimated the wood will be for your project. We mentioned this above, but do not store Ipe decking lumber or more than 30 days without double-checking with us at Ipe Woods USA. Make sure you plan adequate space for your joists. Following are sizes that should not be exceeded. Both a 1 x 4 board or a 1 x 6 board need a spacing maximum of 16 inches. 5/4 x 6 needs a maximum of 24 inches. 2 x 6 needs a maximum of 32 inches. If you have ever seen a house that didn’t have the proper pitch away from the house, you have seen a home with water problems. Not only must the ground slant with the proper pitch, but any substructure must also be pitched away from the house to prevent flooding during rainstorms. We recommend a minimum of ¼ inch pitch per ten feet of decking for standard Ipe lumber. Tongue and groove lumber requires a steeper pitch because it is critical for the water to run off the larger surface. For optimal results, our recommendation is ¼ inch per foot when using tongue and groove. Install framing material with the crown (the side with the humps) up to help with draining water. Standing puddles on a deck can cause the surface to cup. That is why the pitch is so important and the first factor in the installation that we stress. Only 1/8th of an inch can cause standing water to pool, which drowns the wood. Proper pitch means proper drainage, protecting both the new structure and the home. Remember, don’t install hardwood decking over a concrete pad. That can cause a deck to cup and/or crown because of moisture retention. Make sure you have room for framing materials, leaving enough room for the wood to breathe. Leave a gap of 3/32” between the boards with Ipe decking. This provides the necessary ventilation and allows room for the boards to expand and contract due to heat, cold or moisture. You will probably get some shrinkage after installation. Shrinkage varies depending on the local climate, how the boards are used and where they are installed. We anticipate that four-inch wide boards typically shrink about 1/8 inch, and six-inch boards about ¼ inch. Design your deck for good airflow underneath your wood. The best option is 18” of open air under the joists. Open sides allow for cross ventilation. When using skirting, do not block the air flow. These precautions will add stability, eliminate cupping and minimize the Ipe wood’s natural movement. Do not allow water to collect under the deck. Slope the ground to drain water away from the deck and/or main structure. Again, DO NOT build your Ipe wood deck over a concrete pad, ever! Concrete causes water retention and the boards to cup and crown. To stabilize the wood, Ipe Woods USA deck lumber is shipped with the ends sealed with a special clear wax. This prevents any adverse movement and end checking. When you make fresh cuts, the cuts should be sealed with wax within 24 hours with an end grain sealer. We sell this in quart containers that will usually cover about 500 square feet of decking. Easy to apply, it dries clear. This sealant is not for the decking surface. If any sealant gets on the surface, wIpe it up immediately! The old adage in both sewing and woodworking is, “Measure twice, cut once.” This adage has never been more true than with Ipe wood. Pre-drill holes. You’ll get the correct angle and it will be easier to avoid cracks or fissures in your wood. Ipe wood can be either finished or unfinished. Either is lovely. Choose what fits your style the best. If you want to finish it with oil, we recommend a product in our Products section. You do need to oil it at least once after installation, even if you are choosing to go the unfinished route. As we mentioned before, Ipe lumber is called ironwood. This hard and dense wood needs special saws and drill bits. Just a repeat to help you find the information…for sawing, go with premium carbide tipped saw blades. For drilling, we recommend Brad point or Fostner drill bits for a cleaner hole. There are two types of fasteners and screws we recommend for Ipe wood. Use either stainless steel or Protech coated. Any other fasteners can ruin the appearance and finish of your Ipe wood deck. If using stainless steel, make sure you have 305 grade stainless steel or higher. Stainless lower that 305 will discolor the wood around the screw or fastener, and the hardware is likely to corrode or fail. The CAMO® Edge Hidden Fastener System When fastening deck boards, pre-drill. The only exception to this is if you are using Protech coated screws and the Camo Edge Fastening system with expert-level experience. Even so, we recommend you pre-drill your boards to make sure you avoid cracking the wood. Pick a screw size and pre-drill your holes. If you don’t, the boards can split due to their density and eventually become loose. A split can cause irreversible damage. This has a few advantages. Only have to pay for the screws and one tool. Easier to repair boards or replace boards in the future. No predrilling (expert level, officially we still recommend predrilling) Using the Protech screws no pre-drilling is required, thus saving time. No need to pay extra for pregrooved boards. Pregrooved boards actual lose some thickness and width, in the milling process. Not the case when using this system. 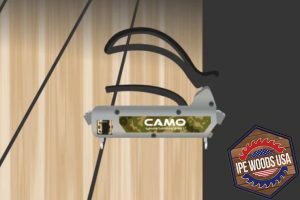 The CAMO® Hidden Clip System We like the CamoClip® hidden deck fasteners. This excellent system allows expansion and contraction of the wood, prevents deck blemishes and avoids too much pressure on the screws. It is designed to help keep the wood safe from water damage and splinters. Be sure to follow all the directions that come with your product. If you are curious about the Camo systems, there are several good youtube videos showing both installations. Watch https://www.youtube.com/watch?v=-iwaI2nV6Ek for regular fastening, and https://www.youtube.com/watch?v=7y4sSe5hCAk for hidden clips. There are many other videos to choose from! Take a look and see how easy a new desk is to install! Face Screw/Plug Method For this one, you countersink 3/8” holes into the deck boards’ face. To make things go fast and easy, pre-drill 1/8” pilot holes all the way through the deck boards. Use stainless steel (305 grade or higher) screws to screw the boards down. Glue (use a waterproof glue such as Gorilla brand, or epoxy) 3/8” Ipe wood plugs in the holes. Knock the plugs off with a chisel and sand smooth, using 80 grit sandpaper. Finish Screws In this method #7 or #8 stainless steel trim head screws are screwed into the decking boards. Use two per joist. The head is so thin and small you hardly notice it. Torx drive screws strip out less than other types. Tongue and Groove Porch Decking This type of decking is for use ONLY with covered porches or patios. With this method, Ipe decks, patios or porches don’t have to be only for spring and summer use now. With things covered, you can enjoy them year-round. Tongue and groove decking must be installed directly on top of the floor joists. The deck needs ventilation underneath, so you can’t install them on a sub-floor. The lumber needs to be covered, and also will need a pitch away from the house for drainage. There are no gaps in tongue and groove decking. Just like interior hardwood floors. Pre-drill a hole at a 45-degree angle in the board where the tongue and face meet. You’ll see a slight v-groove in the corner. Then drive a trim head screw through that same hole. It must be trim head screws. The screw will sink into the groove, and this allows you to slide the next board right into place, concealing the screw head, and giving a smooth connection. The best finish for Ipe wood is Ipe Oil. Many oils and finishes will not properly work on Ipe. They don’t dry right and that ruins the whole effect. If you want to use an oil or finish, test it on several sample boards before applying. Ipe Oil is formulated for Ipe wood, so it matches the special needs of this denser lumber. It is the only finish we recommend. Whether you choose to let your deck weather to a lovely silver-grey color, or if you want to keep it a rich, dark color, we recommend that you use Ipe Oil immediately after installing. This helps the wood keep its own natural oils, and also helps it stabilize. If you have a low ventilation installation, the oil should be put on all four sides before installation (but after acclimatization). Either color is gorgeous, and maintenance is low. For the richer color, you only have to apply the oil once every couple of years. For gluing plugs into deck boards, we recommend waterproof polyurethane glue. Another excellent choice is an epoxy glue, because it can be dyed to match the deck, plus it has a strong waterproof bond to further protect your lumber. Choices, choices, choices: the right deck style for you! Which style of deck should you choose? Traditional outdoor decks are exposed to the elements all year long. Either standard or pre-grooved Ipe deck boards are the perfect choices for a traditional outdoor deck. Personalize your choice with the pitch, gap and finish that expresses your unique style. Remember, when you install your Ipe wood, leave a gap of 3/32” for air-dried lumber, and 1/4” for kiln-dried. Tongue and groove does not leave a gap between the boards. As mentioned before, the tongue and groove can only be used where there is an exterior protecting cover, such as a roof. It has a more finished look, similar to an interior floor. With Ipe wood, this type of application can now be used outside, due to the durability of Ipe. Covered porches and patios can now be used all year long. When choosing how you will fasten the boards to your frame, consider the look you want on top. Both of the Camo systems we recommend are very discreet in the way fasteners are hidden. Our favorite system, the Camo Hidden Clip system, leaves the boards with no visible holes. The Camo Edge Fastening system is also excellent. It comes with a tool that guides you for each drilled hole, and screws are discreetly placed so they are hardly seen. Both systems are great with ¾ “ or even thicker boards. There are several other options for fastening your deck. With standard boards or grooved boards you can use finish screws, or even screws where you insert a plug to cover the screw hole. These methods can also be found on Youtube. 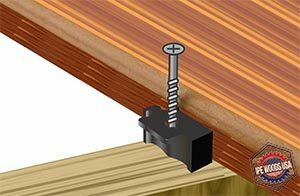 With finish screws, you drill two screws per joist (#7 or #8 stainless steel screw, we recommend Trox because they strip out less wood) in the boards. The holes are small and not terribly visible. With the plug method, you begin by drilling a 1/8 inch hole to start, then insert the screw. After, you glue a small Ipe wood plug into the hole, sanding, chiseling or cutting off any part that is not flush with the boards. Make sure you use stainless steel screws, grade 305 or higher, and waterproof glue, such a Gorilla brand or a good epoxy, to insert the plus. Tongue and groove decking must have ventilation underneath. It can only be installed directly on top of the floor joists. That means you can’t install tongue and groove on a sub-floor. Make sure the lumber is covered, and the pitch is away from the house for drainage. Pay attention to the pitch. It looks like an interior hardwood floor because there are no gaps and so the pitch is steeper than with standard or grooved boards. There is a slight v-groove in the corner. Pre-drill a 45-degree angle hole where the tongue and face meet. Finally, drive a trim-head screw through the same hole. Only use trim-head screws. The screw will sink into the groove. When you place the next board, it will conceal the screw head. The result is the wonderful look of an interior floor outdoors. The boards will fit together smoothly. Contact your local building department before you begin designing your project. They know the codes and ordinances about what you can build and where you can build it. Obtaining the proper permits is solely your responsibility. Ipe Woods USA can provide information to help you in making your selections. It is solely your responsibility to know your building codes and Ipe Woods USA will not be held liable if you neglect to obtain the proper permits, or if you fail to comply with all zoning ordinances and building codes. The information contained on this site is meant to be used as a reference only and is not to be interpreted as a guarantee of any sort. To properly install your deck, we recommend that you work with an experienced professional. All information on the site is only generalized recommendations. We are not and will not be held liable for improper installation, for any reason, including but not limited to information inaccuracy. Again, consult a professional for all things related to installation. CONGRATULATIONS ON A PURCHASE THAT WILL BE MORE BEAUTIFUL AND OUTLAST ANY OTHER DECK YOU COULD INSTALL!! IPE WOODS USA IS HAPPY TO WORK WITH YOU ON IMPROVING YOUR LIVING SPACE! THANKS FOR THE OPPORTUNITY!